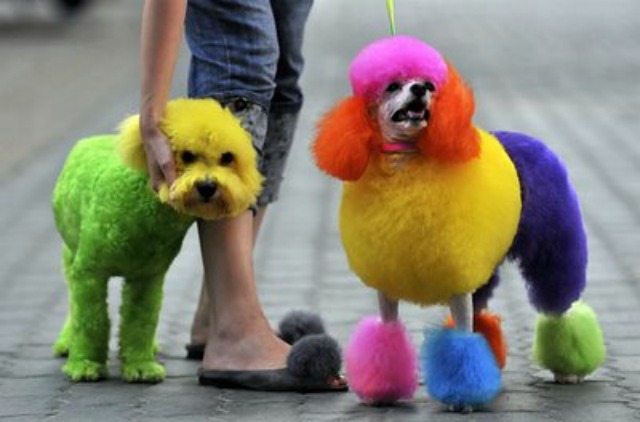 Hair Advice (+ all things nice) | UK Hair Blog: Dip-dye your dog?! It's not often hair trends and animals collide. Well, there is the old saying about people looking like their pets, and I'm all for a quick wash and brush for my two dogs but dip-dye...a step too far? Amber Heard clearly didn't think so, as she dip-dyed her mini Yorkie, Pistol. Before you panic and alert the RSPCA, she apparently used food dye to create the 'look'. Poor Pistol was pictured sporting pink tipped paws and ears whilst being carried by Heard - barking mad! Apparently this crazy trend for man's best friend started in New York, where you can find numerous salons willing to pamper your pooch. Also whilst we are on the subject on treating your dogs like accessories, put the dog down! It has legs, and does this amazing thing of walking on them. Maybe I'm just jealous I can't lug my dogs around under my arm (I need the arms of a boxer - they weigh a ton!) but I don't like seeing dogs being carried or stuffed in bags. I can only imagine the reaction if I headed towards Holly and Percie with a bowl of dye. Probably a Holly and Percie shaped hole in the wall in the style of Tom & Jerry. What do you think? Would you dip-dye your pets? oh noes poor dogs don't look very impressed do they? Our 2 freak just having flea drops applied so I bet they'd run a mile if I came at them with some bright coloured concoction ! !